Establishing a safe haven for your data is the ultimate priority for us. We apply best practices to select the best location for our data center building in Indonesia. You can rest assured that your business is well-protected because we put your invaluable data assets in a strategic and safeguarded place of data center building facilities. Our data center built with strategic planning to be able to count on as the most reliable data center and as a disaster recovery center. Located 200 meter above the sea level in a flood free area. Strategically located in Bogor, Indonesia, 42 km south of Jakarta, very ideal for Disaster Recovery Center (DRC) site. Power infrastructure designed with multiple redundancy to create layers of energy supply which guarantees continuous operation in our data center. Our Data Center uses state-of-the art Environmental System Technology which provides high environment stability required to run mission-critical operation. Fire Safety features are in place to achieve quick and proper response in the event of fire disaster. Our security systems are equipped with access control and CCTV surveillance monitor. Telecommunication system uses multiple back up to prevent communication failure such separated fiber optics feeder. Keeping invaluable data safe and secure requires sophisticated hi-tech facilities. 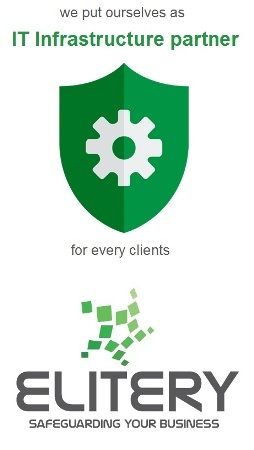 We go the extra mile to make sure your assets are protected with the latest, most reliable and cutting-edge technology. Your security is at the top of our priority list as we provide nothing but the best and well-equipped data center for your business. Elitery Data Center provides client needs by having various additional facilities such as : Registration, Lobby, Meeting Room, Staging Room, Meet me room, Lounge Area, Rest Area for client staff and employees, Praying Room, Pantry, Solid Entrance Gate, etc to keep comfort at our data center building.